We'd like to take a moment to thank everyone who came out to show their support for Officer Caprio, her family and the law enforcement community. Despite the tragedy that brought us together, the spirit of the event was uplifting and inspiring. And we truly hope we didn't leave anyone out! We also can't forget the countless volunteers who gave their time and effort to planning, set up and clean up. Thank you all so much! I usually ride solo as I use biking to escape reality. However, I am interested in planning a memorial ride to my wife Amy Caprio who passed away in the line of duty on May 21. It is just something I can say thank you to her on a personal level to the service she provided. I don't know a better way doing it then with the activity I love to do. 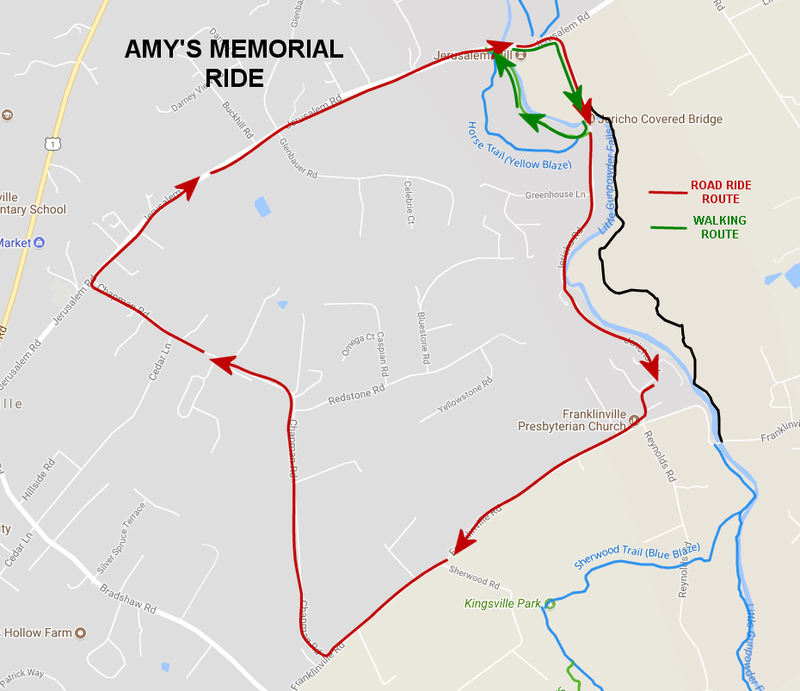 We will hold a Memorial Bicycle Ride for Officer Amy Caprio on Sunday, June 3rd, beginning at 9 AM, with wheels rolling by 10:00 AM, beginning at the Jerusalem Mill Historic Village in Kingsville, MD. Area and route maps have been added below. There is no registration fee, but all donations are appreciated and will go to Harford Humane Society and Baltimore County’s Police Assistance and Relief Fund, key word “Amy’s Ride”. While this is intended to be a mountain bike ride through the beautiful trails of Gunpowder Falls State Park, there will be a short scenic country road portion through the Kingsville area, that will allow less-experienced riders and non-mountain riders to participate. The current proposed route, includes a roughly 5 mile road loop returning back to Jerusalem Mill and then a roughly 7 mile mountain bike ride. Due to our start location, the mountain bike portion does contain some sections that are not beginner-friendly, and with likely wet conditions, may be even more challenging. This event is now going to occur rain or shine. We will make the best of whatever mother nature gives us. All riders must wear a helmet and are encouraged to wear blue jerseys or shirts, or black, if you don't have blue. There has been an outpouring of offers to help and assist and that is greatly appreciated. While we have most jobs covered, if you'd really like to help, you're welcome to arrive early and say so at the registration table. Please understand we may not have something for you to do. We expect a significant turnout for this event and traffic and parking will be a challenge. Please carpool where possible and for local riders, please consider biking to the event or parking remotely and biking in. We ask for everyone's patience and understanding while making their way in. Please follow parking attendant's instructions so things can flow as smoothly as possible. ​If you have any questions, please email gumbo@littlegunpowder.com and we will do our best to answer them.